The prison versus Woodbury war is still on the horizon, but I wasn't surprised that no major battle between the sides took place this week. Really, "This Sorrowful Life" dealt with the conflicted ideals of Rick, Daryl and Merle over giving Michonne over to the Governor. I was surprised initially at how long Rick was willing to go with handing over his hostage for the slim concept of hope. I know he tries to think in the best interest of the group, but it was certainly dangerous only bringing a few others into the knowledge of the deal. Except, I really felt like Rick as a character, couldn't ever go through with giving her over. It just never ultimately seemed plausible for him. And I really liked that when it came down to it, after a little dead Lori vision, he told everyone what the deal was and how he was ready to fight instead. It certainly separates him from the Governor. It was definitely a great speech, as he came clean bout the ordeal to the people who have invested their allegiance to Rick. He's the leader and it's enjoyable to watch him be so, despite his conflicted emotions. I'm glad he didn't go full dark side and hand over Michonne. That said, he did invite Merle into his inner circle. I think that having Daryl help him was a part of his so called trust, but at the same time, Merle has always been that guy you can go to with problems that need some darker resolutions. 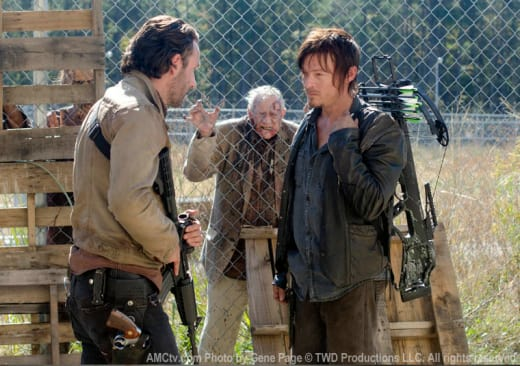 It was even a fantastic scene with Merle talking to Rick about the strategy of handing over Michonne. Having him hiding in the dark with his face half covered by the shadows added to the moment. Certainly, it made sense that Merle could be the person to follow through on capturing Michonne. He's done a lot of questionable things. Yet, it was more shocking and character changing when he decided to let Michonne go. I didn't find the scene with the car alarm scary at all, although having Merle get the walkers to follow him in the car was hilarious. Stopping for a few seconds and then moving forward closer to the meeting place was genius. Although, I feared the end result of Merle's attempt to redeem himself. He's always been something of a jerk, but coming to a conclusion to take out the Governor was a hugely bold and daring step. Yes, his plan partially succeeded and he went out as something of a hero worked wonders, but I was still upset with how it all played out. Merle has been a fantastic and interesting character, and having him bite the bullet was a huge disappointment. I wanted him to survive, but at least his final outing was heroic. That said, it was tragic watching Daryl discover the newly zombified Merle eating a corpse. Daryl has desperately wanted his brother to join the group in a positive manner. As much as Merle wasn't liked, he was still Daryl's brother and even throughout the episode, Daryl was advocating hard for his kin. Daryl has always been a fantastic character, probably one of my favorites, and seeing Norman Reedus emote the sincere and heartbreaking feelings was moving. I believed the pain he felt, the sorrow, the guilt, the anger and everything in between. Even stabbing his brother multiple times further exposed everything he was feeling. It's definitely a turning point for Daryl's character, who has been that loyal friend and follower to Rick, as well as great guy for the group. And despite his brother being the more hated member of the group, Daryl still wanted him to join the prison team. Daryl might have a lot harder of a heart when it comes down to it. I still wish Merle survived, but it was a wild and shocking change of events. There was clearly a sense that everything was still at that waiting moment before the big battle for The Walking Dead Season 3 finale, but at least Rick, Daryl and Merle came to some major decisions. There was something gripping in watching each come to their emotional conclusion, essentially setting their fate in motion for the final battle. I still wish Merle didn't meet his demise, but it was a wild twist in how it all went down. It certainly was far more engrossing then "Prey" and makes me really want Rick to defeat the Governor for the finale. All roads lead to this and I'm looking forward to seeing how it all dramatically concludes.